In 1994, the original Donkey Kong Country single-handedly saved the Super Nintendo from losing to the Genesis. The gorgeous platformer had everyone talking, with its solid gameplay, classic characters, and, most importantly, absolutely revolutionary visuals. After two sequels in as many years, the Donkey Kong Country series came to an abrupt halt. Donkey Kong himself (troubled hero that he is) has since starred and co-starred in many games, but a new, proper Donkey Kong Country follow-up was never released. Well, the series is back, exclusively on the Wii, and we have Metroid Prime impresarios Retro Studios to thank for it. And, trust me, you will want to thank them after playing this game. In fact, you may even want to have their babies. I am not even going to launch into a pre-jump tease. Donkey Kong Country Returns is good. Very good. I would even say it is one of the best 2D platformers I have ever played. NOW HIT THE JUMP SO I CAN TALK ABOUT HOW MUCH I LOVE THIS GAME! Take it all in while you can, because 2010 may be the best year ever for Nintendo-published platformers. Earlier this year, Nintendo released Super Mario Galaxy 2, a game I think may very well be the best 3D Mario game ever made. Just last month, Kirby’s Epic Yarn came out, one of the most polished, beautiful, and creative entries in the adorable franchise. 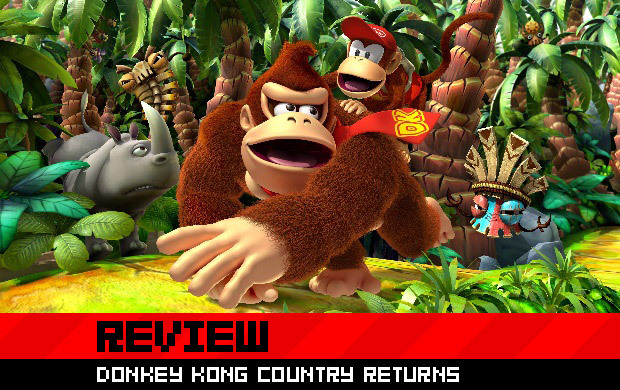 And now we have Donkey Kong Country Returns, a game I can easily say is the best Donkey Kong game ever released. That’s three major Nintendo platforming franchises right there, all releasing three of the best games in their respective series all in one year. For a fan of platform games, 2010 is going to go down in the record books. 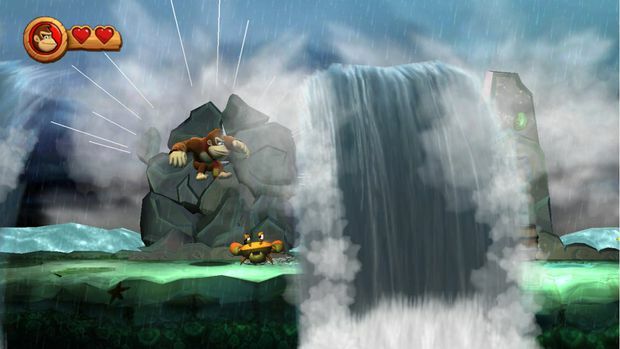 But, what specifically makes Donkey Kong Country Returns so amazing? I am going to try my best to refrain from filling this review with ALL CAPS AND EXCLAMATIONS! 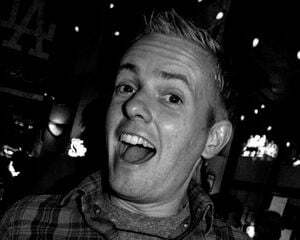 I am an incredibly excitable guy and this game got me very, very excited. It is going to be tough to show restraint. 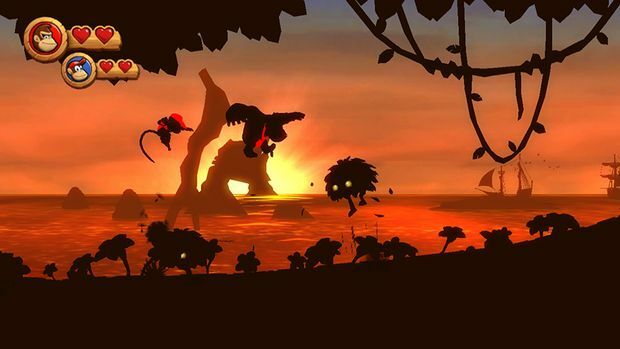 In a clever nod to the original Donkey Kong Country, at the start of this game, Donkey and Diddy Kong’s banana hoard is stolen by a troublesome gang of Tikis that call themselves the Tiki Tak Tribe. Admittedly, it is a little sad to say goodbye to the Kremlings (the enemies from the first three games), but the new characters are very well-designed and have a personality all their own. Your nostalgic sadness will only last for a second. The new enemies in Donkey Kong Country Returns are awesome. Once the story is established, control quickly switches over to the player. Right away, retro fans (especially fans of the original Donkey Kong Country) will get excited. The classic tree house, complete with hidden red 1UP balloon and bouncing tire, greets the player right as the first level starts. From here, Donkey and Diddy’s adventure begins. And what an adventure it is! In a first for the series, two players can conquer the game together in co-op mode. One person plays as Donkey Kong and the other as Diddy. Both have slightly different specialties, but mainly control the same. As enjoyable as the two-player option is, the game is even more fun with one player, as the levels are filled with so much to do that slowing down to keep up with each other can sometimes hinder the overall extraordinary experience. This is not a knock on co-op -- I had a great time playing with a friend! -- it’s just not my mode of choice. When playing as one player, Donkey Kong is the main controllable character. Admittedly, the controls take just a couple of levels to get used to. While I initially thought turning the Wii Remote to the side like an old-school NES game would be for me (this is one of two control options), I eventually learned to love the main control scheme: the Wii Remote/Nunchuk combo. This is because, in addition to the normal moving, jumping, and grabbing buttons, players can shake the Wii Remote and Nunchuk to make Donkey Kong perform a ground pound. You will use this move a lot, mostly to uncover secrets and discover hidden passageways. This concept turned me off when I first experimented with it, but I got so used to it that I learned to not only love it, but started to look forward to it every time I had to use it! There is nothing more satisfying than destroying a giant stone pillar, banging on a secret-revealing drum, or unleashing a brutal finishing move on a boss using this physical technique. The control scheme -- while initially a little complicated -- works beautifully. In no time at all you will find yourself performing daring jumps and defeating numerous enemies without even hesitating. Okay, now that the basics are out of the way, it is time for me to lose my mind with excitement over how much this game blew my mind. Sure, I adore retro games and absolutely love classic 2D platformers; for this reason alone, I was excited to play Donkey Kong Country Returns. What I wasn’t expecting, though, is how much the game would make my jaw drop with every new level. Retro Studios really needs to take on every single Nintendo franchise from here on out. 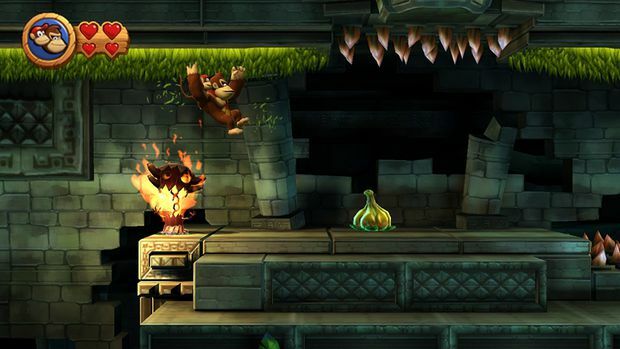 They did wonders for the Metroid series with Metroid Prime, and now -- although it is not quite the same revolutionary leap -- they have done the same with Donkey Kong Country. Not only is the game super-polished (a Retro trademark, in my humble opinion), the level design is unbeatable. UNBEATABLE! The key to great level design -- especially for a 2D platformer -- is when every jump, every enemy, and every obstacle is perfectly planned and perfectly placed. Nothing is worse than playing a game when everything in the level feels sloppy and not well put together. The levels in Donkey Kong Country Returns are not only impeccably designed, they are rich with constant “wow” moments that will happen from the first seemingly basic level to the surprising, wholly satisfying final boss. I get so excited when I think about the flat-out cool things I experienced when playing Donkey Kong Country Returns that I want all of you to play it right now so we can talk about them. In some levels I was riding on the back of a whale ... in other levels I was running from a giant tidal wave of deadly bugs while spinning around rotating, dizzying stone discs and swinging on huge vines ... in others I was whisking around on a rocket barrel as a mine cart full of bomb-throwing moles was circling around me at all different depths on roller-coaster-like tracks. 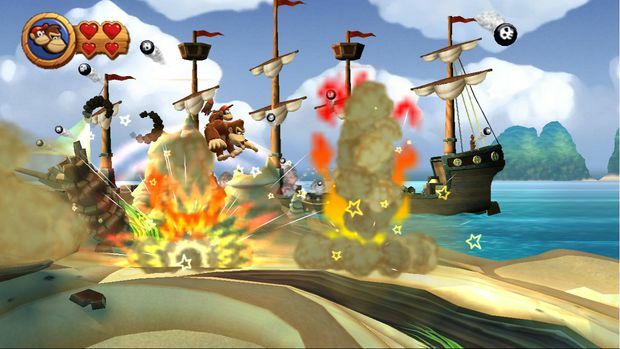 In fact, A LOT of the best things from DKC are back for Donkey Kong Country Returns. While not all the animal friends make a return, Rambi the Rhino is playable in the game, and getting him for the first time will make you giggle with excitement. The hidden bonus rooms, allowing Donkey Kong to rack up a ton of bananas and extra lives, are also back, and finding them is just as satisfying. Most importantly, though, the barrels make a grand return and are scattered throughout many levels in the game. AND THEY ARE SO MUCH FUN! Shooting Donkey and Diddy Kong all over the screen (including different depths!) is one of the most entertaining and satisfying things I have done in a videogame in recent memory. Each time you come across a barrel section in the game you will not be ready for what you are about to experience. And as fun as they are, the barrels are not even the best part! Even with all this amazing stuff -- and just when you think Retro can’t fit anymore creativity in the game -- the next level will start and you will be wowed all over again. I am not exaggerating. The level design in Donkey Kong Country Returns is some of the best I have ever seen. As unique and remarkably creative as the levels are, they could have fallen apart if the game were too easy. Not to worry. Donkey Kong Country Returns is super-challenging. At one point, early in the game, I had racked up almost 30 lives. I thought: “Uh-oh. Is this going to be a game I gain tons of lives in, only to never die?” Three levels later, I lost all my lives in one level and actually had to use a continue. While the challenge is definitely there on some levels, it is NEVER unfair, relying completely on the player’s skill and never on poor level design. Even better, by collecting puzzle pieces (which classic character Squawks can eventually help you find) and K-O-N-G letters on each level, Donkey Kong can unlock secret, bonus levels (reminiscent of Super Mario World) that are EVEN MORE out-of-control tough, but in an oh-so-satisfying way. With a ton of incredible levels to conquer; gorgeous, perfectly designed graphics (wait until you see the first sunset level! ); retro-inspired music; and smooth, flawless gameplay, videogames don’t get much better than Donkey Kong Country Returns. If you have a Wii, BUY THIS GAME. You will not be disappointed. And please hurry. There are so many memorable parts I want to talk to you about. 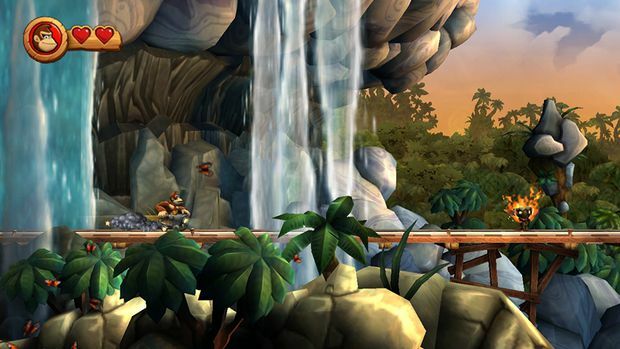 Donkey Kong Country Returns is a perfect videogame experience, from start to finish.